Last week I was squinting at my phone trying to identify some fuzzy little creatures that a friend had posted on Facebook - kittens..no...no..goslings..no...muppet babies? - turns out they were newly hatched chicks being raised by Brooke Kornegay and students at the ASU Sustainable Development Farm. I had been wondering which local farm I might visit first this growing season but after seeing these fuzzy hatchlings my next farm photo mission was clear. Brooke who has managed the farm since its inception greeted and showed us around the grounds. She explained that it was still early days on the farm so not many things would be growing in the fields besides cover crops and some German hard-neck garlic. The 359+ acre farm was a gently rolling landscape with an imposing old condemned barn, farm house and 1970's brick rancher. I love old barns - especially the condemned kind - remnants of cattle tack hung from old beams as bright morning light seared through leaky chinking and worn herringboned timbers - and sort of making me feel as though a Close Encounters style spacecraft might be landing in the adjacent field! Since ASU acquired the property from Beulah and Reeves Vannoy in 2011 as part of the Blue Ridge Conservancy many more structures have been built including hoop houses, hen houses, outhouses and this strikingly designed shed made by Sustainable Development students. One hoop-house was filled on one side by starter trays for arugula, chard and various herbs. And on the other by cultivated rows of kale and clover frothing from richly earthed beds. We then returned to Brooke's office where the sounds of chirpy chick-lets shrilled the air. Luna vigilantly guarded their softly lit enclosure and eyed me suspiciously as I attempted to capture their chaotic maneuvers. Every once in a while one of them would suddenly doze off on its feet. They were a feisty little brood comprised of Javas, Domininques, Silver Spangled Hamburgs and one lone Sylkie. Occasionally they had choice words for one another! In the hen house the egg laying action was in full swing led by one very focused Cuckoomaran. The hens strode confidently around their netted yards taking drinks from an old water feeder and basking in the morning sun. Brooke explained how they worked hard to create super rich soils by composting and the vital support of nature's best enrichers - worms. She then proudly heaved a large tub from her office to show us in glorious and horrifying technicolor the worms at work. Warning! - Look away now if you fear what transpires in the dark heart of the Mother. I pulled out my macro-lens for a really grisly close-up! It was an amazing and revitalizing morning on the farm and I can't thank Brooke enough for showing us around. I promised to return in the fullness of Summer to capture the farm in a harvest kind of way. And thanks as well to Luna for her sweet tempered tail-wagging company! I was invited to photograph the Appalachian Energy Summit last month when leaders from across the state of North Carolina and beyond gathered to discuss, brainstorm and ponder practical new pathways towards energy sustainability. The summit opened with a Leadership Luncheon in a wonderfully geometrically charged room! Two of the summit's globally recognized speakers Amory Lovins and Robert F. Kennedy met before leading the room into meaningful discussion. The theme for the summit this year was "A New State of Energy," and my mission was to photograph the 3 day event and ALSO create a slideshow to play at the closing plenary session of the summit. This meant pulling a true "All-Nighter," in order to process, select and develop the images that would comprise the slideshow and best represent each rich event within the summit. And of course, setting it to some jaunty music and rhythmically timing the images. My goal was to capture a little "Lightning-in-a-Bottle," and express the electric feeling that was so evident throughout the 3 inspiring days. Click on the image below to watch. This was an amazing event to shoot, the atmosphere throughout the summit was energized with hope and humor. I want to thank visionary leader Ged Moody for providing a space designed to nurture creativity, connections, and offer real hope in an often times bleak climate change landscape. And thanks also to his wonderful team for their support driving my assistant and I between buildings and raindrops in mad-cap style. Jill walks me to the hoop houses to begin her daily regimen of activities which starts with opening the flaps on the side of each house by crank. The operation I discover is super-organized and Jill talks me good-naturedly through the rhythms of her daily regimen. Watering, of course, purple radish micros are first. And then preparing new trays to replace yesterday's culled batches. An Appalachian State University student-intern helps Jill by unloading soil for the trays. Then filling them row by row with an organic "special formula" of soil and soil enrichers. Don't ask me what they put in their formula as it is definitely top secret! At this point of the shoot David suddenly appeared with a couple of bunches of the most camera-ready rainbow chard you've ever seen - which was perfect, as I wanted to shoot a few portraits of the couple as a gift for their marketing purposes! I kept getting drawn to examine the finer details of each micro-green tray - I'm not kidding, they are fascinating, sort of like those beautiful mossy terrariums under glass. And you just want to keep patting them like a freshly buzzed head of hair - or maybe that's just me? Sunshine Cove grows over 30 kinds of micro-green and produces 10+ different varieties of mix. I enjoyed tasting the elements that make up their mirepoix mix - mini onion, carrot & celery greens. I loved being able to eat the carrot greens, we usually throw out the frothy tops of the adult vegetables. I didn't expect these greens to taste so....."carrot-y," all earthy and sweet. Suddenly, a special guest darted through the hoop house - Roscoe the cat, followed by David and Jill's daughter, Olivia, who scooped him up in her arms - much to his chagrin! I then took a jaunt out to the gardens where I encountered one of the most colorful compost piles ever! - it reminded me of some modern art / earth work sculpture. Turns out the retired micro-green beds make excellent ground for the adult veggies, like these maturing patty-pan squash that were in full bloom. Through the lens from below I felt like I was in some Jurassic world. It's a pleasure discovering each new farm in the High Country and Sunshine Cove was no exception. 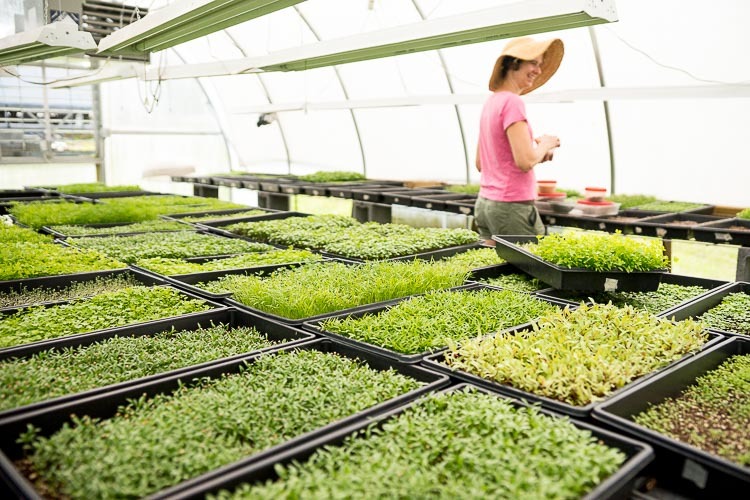 You can meet David and Jill at the Watauga County Farmer's Market where they sell their little, lyrical and delicious micro-greens (and other produce) weekly. Generally I begin my year in farm photography once the growing season has gained some momentum, fruit trees have started into bloom and asparagus stalks are lancing through their straw strewn beds. But this year I decided to switch things up realizing that my farm-photo storytelling was missing a key moment in the annual growth cycle - namely, the beginning - The Seeds. Really what prompted this interest was listening to an inspiring podcast about the great global seed bank on Svelbard - a frozen underground facility storing over 10,000 seed samples and designed to help us re-boot the world should nefarious or "natural" disasters wreak doomsday proportioned catastrophe upon our botanical world. 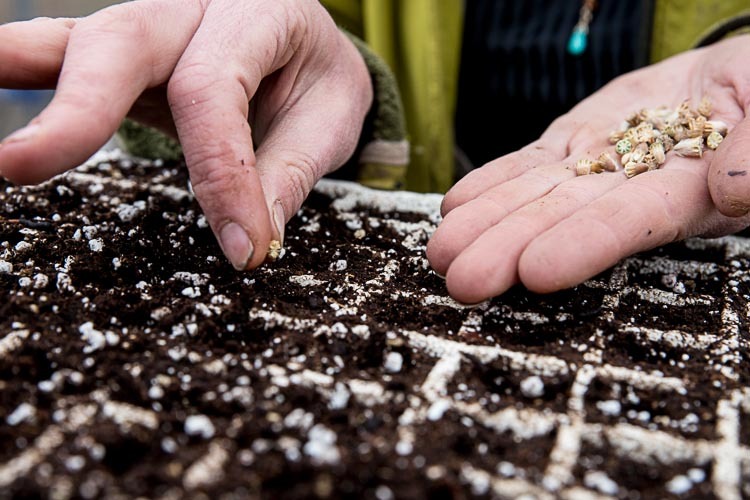 I was hooked and wanted to explore how our local seeds were being stored, cultivated and exchanged. I began my seed quest with Lee Carlton of Goldenrod Gardens in a greenhouse perched on the back of Beech Mountain. Like many farmers and gardeners she had a generous heap of seed catalogs lining tables for inspiration. And her own seed vault filled with tried and tested cultivars. Some seeds of course are culled from a previous year's harvest like these miniature indian corn cobs that Lee uses in her beautiful ornamental wreaths. Lee carefully plucks each kernel from the cob at the root in order to keep them in tact for planting. I love the way these gold and bronze colored kernels looked against the patina-ed copper basinet. Lee then showed me a number of other forms of seed collected from the previous year's harvest like these Scarlet Runner beans. I was amazed at how these Bottle Gourd seeds resembled a crusty sour dough loaf when I trained my macro lense on one up close. And these Zinnia - the seeds are the green bits mixed in with the colorful dried petals. Up close they look like little arrowheads. Or these "Ruby Moon" Hyacinth Vine seeds. Lee was working on a number of starter tray projects in the greenhouse. A tray of baby Chard. I had no idea about the delicate process of switching between starter trays. Here Lee is transplanting from a toddler to kindergarten sized tray. I had to include this image too as I loved seeing these young Delphinium shoots peering from a wonderfully geometric tray. Rain pattered on the greenhouse roof as Lee continued to organize and label the various sproutlings. 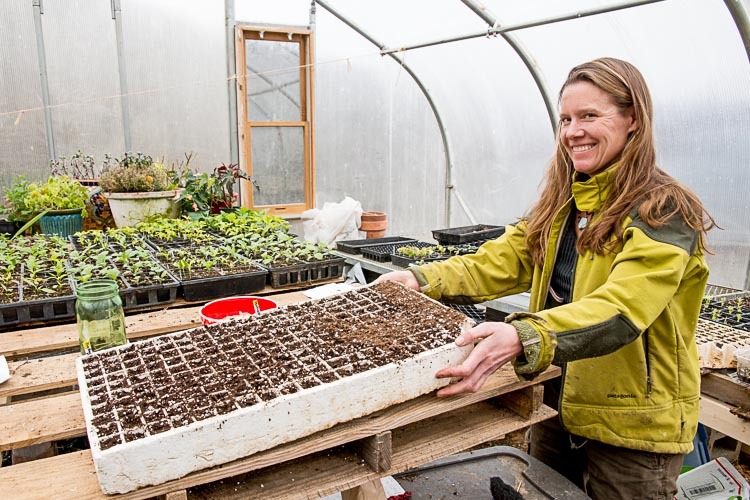 I am extremely grateful to Lee for showing her seed collection and starter greenhouse to illustrate the beginning of one local farmer's year. Look out for Goldenrod Gardens at the Watauga County Farmers Market which re-opens Saturday, May 2.